Win 7 Security 2018 is a new fake computer protection application. Win 7 Security 2018 claims to provide the ability to perform a scan, internet security, personal security, proactive defense, and firewall. Win 7 Security 2018 is one of many new fake applications, which include Win 7 Anti-Virus 2018 and Win 7 Home Security 2018. While these fake antivirus applications may be new, Win 7 Security 2018 shares features and design with other fake antivirus applications. This is generally due to the fact that many fake antivirus applications are clones of each other with slightly new features; this is possibly done to make it harder to be found and removed by antivirus applications since the virus constantly changes. The original version of this fake antivirus application was introduced around February 2018 and had a file name of AV.exe; the biggest modification to the virus is that the executable file name will generally changes from computer to computer. Win 7 Security 2018 is different from other fake antivirus applications in that it changes its name from operating system to operating system. For example, the fake program will display the name of the program as Win 7 Security 2018 when it infects systems running Windows 7. However, when the fake program infects a computer running Windows XP, it will change its name to XP Security 2018; the virus will change into Vista Anti-Virus 2018 if it infects a computer running Windows Vista. This was possibly done to convince the user that the fake antivirus program is associated with their computer since the name of the fake antivirus program has the operating system of the computer. Win 7 Security 2018 main executable is generally a series of three random letters; this executable is similar to AV.exe and AVE.exe, which are the main executable of previous clones of this virus. Win 7 Security 2018 will modify the registry; therefore, the registry must be fixed before removing the main executable file. Win 7 Security 2018 will modify the registry to set the fake antivirus program to run when any other executable file is run. The comments here and comments here may provide insight into the successful removal of Win 7 Security 2018. The main executable is generally a hidden file; therefore, it is important to turn on hidden files in the file explorer in order to see the hidden main executable file. In Windows 7, search “show hidden files and folders” in the Windows Search Bar to see folder options. Below is our recommended removal tool for Win 7 Security 2018. The removal tool has been rated 5 cows out of 5 by Tucows and was previously CNET’s Editor’s Choice. Feel free to download it below. Win 7 Security 2018 Removal Tip - If Win 7 Security 2018 is blocking applications from running, right click on the application file and select “Run as administrator.” This should allow the user to install removal software in order to successfully remove Win 7 Security 2018. Win 7 Security 2018 Removal Tip #2 - Win 7 Security 2018 will make web browsers (Internet Explorer, Mozilla Firefox, and Google Chrome) unusable by showing the following page when attempting to browse the web. The best method to run the browser is to right click on Mozilla Firefox or Google Chrome and select “Run as administrator.” This method will not work with Internet Explorer. This should allow the user to browse the web and download removal software for Win 7 Security 2018. Win 7 Security 2018 Removal Tip #3 - Try logging into a different user account on the computer. Attempt to run a scan from that user account. If you are unable to run the removal tool, or are unable to run any programs in general, you may also need to stop the processes associated with Win 7 Security 2018 with task manager. If task manager has been blocked by Win 7 Security 2018, try using Process Explorer. Win 7 Security 2018, like many other fake antivirus programs, will create a series of warnings and pop ups in order to scare the user into purchasing the fake program. Some of these warnings which are created by Win 7 Security 2018 can be found below. “Win 7 Security 2018 Firewall Alert! Win 7 Security 2018 has blocked a program from accessing the internet. Win 7 Security 2018 will create the following alert when attempting to browse the internet with Internet Explorer. Dangerous code found in this site’s pages which installs unwanted software into your system. Spyware infection in your system. Complaints from other users about this site. It is recommended to use safe mode when removing the virus because Win 7 Security 2018 will generally not be able to load in safe mode. To enter safe mode, restart the computer and press F8 multiple times before the Windows screen to bring up the boot options. 1. Win 7 Security 2018 is generally installed without user permission. 2. Win 7 Security 2018 uses pop ups and fake virus scans to scare the user. Manual Win 7 Security 2018 Removal – In order to manually remove Win 7 Security 2018, the processes associated with Win 7 Security 2018 must be stopped, the files associated with the processes must be removed, and the registry entries must be corrected to the previous state before Win 7 Security 2018 entered the computer. Important: Before attempting to manually remove Win 7 Security 2018, we recommend that the user read through comments posted by other users on how they removed specific fake antivirus programs since many fake antivirus programs are similar. These comments can be found by clicking here. These comments may provide additional information which may be useful in removing Win 7 Security 2018. However, please use discretion since these specific comments pertain to other fake antivirus programs. Your feedback is very highly valued by others so please feel free to comment below. Please feel free to share a solution that you may have used to remove Win 7 Security 2018. This entry was posted on Tuesday, March 22nd, 2019 at 2:11 am	and is filed under Malware Removal. You can follow any responses to this entry through the RSS 2.0 feed. You can leave a response, or trackback from your own site. great info only for me the task to end was hlt.exe. 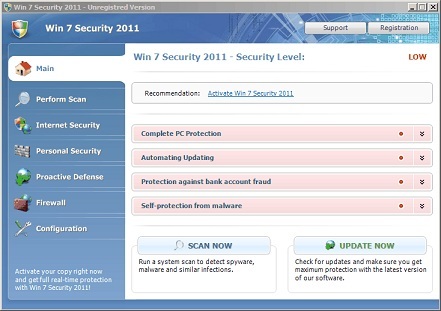 i got “win 7 security 2011″. it introduces itself as a virus-cleaner/program. but it is a virus!! i have read that i should go to safety mode, but it still run! be aware of this! it says it will protect your PC against virus, and it also says that you’r PC is infected, but it is a virus!! Even my Firefox was getting that message and I was unable to access any internet pages until I accidentally accessed the internet through Kaspersky. From there, the win 7 thing was just a popup annoyance, but still needed to be removed. I appear to have a mutation of this virus, none of the guides are accurate anymore. The best way is to restore your computer to a date earlier than when the infection happened. I had to consult my user (my spouse) to determine when she started getting this alert and then I logged in as admin and restored the computer to an earlier date. Now the alert is gone. But I think the software is still hiding somewhere and I need to find it and somehow remove it from the disk. Hope you can tell how to locate the file. In win 7 I don’t see a search option when I right click on a folder. Where did they hide that? When I attempted to delete this manually I used my actual anti-virus program. Invisibly it didn’t go well because I am using my iPod to post this. Although it did delete, it took every single file with it. Every file. I can’t access Internet explored because it took the files I needed. Be careful what you manually do. Just as a general FYI, I have this and like someone above said, this virus NOW RUNS IN SAFE MODE AS WELL. What really annoys me is ESET – supposedly the best of the best protection, did nothing to stop it. Ive gotten this virus twice now visiting very benign websites – a cabin rental site in Maine and a photoshop tutorial site. If this is so common why arent the virus programs stopping it? Helpful website. Downloaded Malwarebytes antimalware program from cnet but couldn’t get it to run. The hint about right-click and run as an administrator did the trick and it loaded and removed the malware. Thanks for the post. This was the only useful website I found on this issue! This virus runs in safe mode on my new dell windows 7. Can’t access the internet. I’m typing this from my phone while I wait for system restore to take my computer to 5.12 and today is 5.14. Update: looks like system restore worked well. I’ve remove the virus, but I still cannot access the internet. Anyone know how to fix it? Using stopzilla now and it is scanning. I had to download it to a flash drive from another computer to put it on the infected computer. Safe mode did me no good and the system restore could not be found on the accessories menu. It looks like stopzilla found it! Thanks for the info. I managed to access the internet by opening the task manager and ending the process after I try to open the internet sometimes it takes more than one try figure out different strategies I cant seem to find the source file tho it sends me to local but I don’t see it a suspicious file named GDIPFONTCACHEV1.DAT is there I don’t know what it is and I don’t want to damage anything. I checked my registry, and tried some suggestion from a forum, but it did not resolve the problem. Same with Eric, safe mode also did no good, I can’t access internet from safe mode. After two frustrated days, I chose to repair my windows.